Bring games, snacks, songbooks, etc. Small group studies throughout the week, see Jason Schooler for more information. CHRISTMAS PROGRAM: Sunday, December 26, 6pm. This program is called "There's a Star in the East", and features a presentation about Jesus' birth and joyful songs from many places. Come enjoy sharing Christmas caroling and treats. Practice for the Christmas program is Thursday, December 23, 6pm. Enter through the basement door. Small group studies throughout the week, see Jason Schooler for more info. 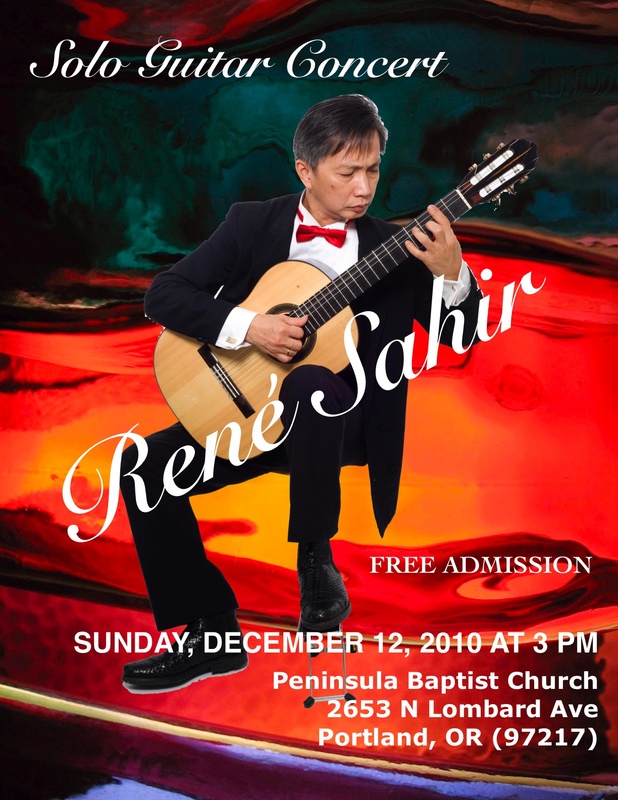 Brother Rene Sahir, a classical guitarist and pastor of the Father's Love Church in New York, is planning on doing a concert at Peninsula Baptist! Concert is free. Any donations will go to support church-planting efforts in Indonesia, which Brother Sahir will also be speaking about. 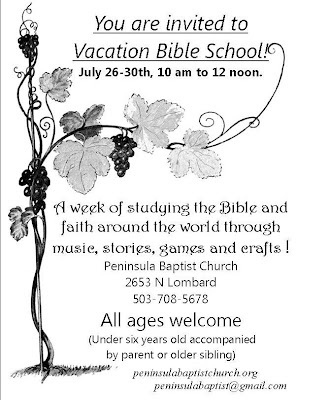 For more info, contact Peninsula Baptist. Fall Women's Bible Study, Fridays at 1:30 through November 19. Meets at Margaret's house, please contact her for details. Fall Women's Bible Study, Fridays at 1:30 pm, through November 19th. Contact Margaret or Alberta Hardy for more info. Fall Revival coming up, Oct. 17-20. Services each evening at 7:00 pm. Daily Prayer for the revival: The church will be open daily at 6:00 am and 6:00 pm for about an hour if you want to come and pray. Fall Women's Bible Study: Fridays at 1:00pm, through November 19, 2010. Contact Margaret Hardy for more information. Fall Revival coming up, October 17-20, 2010! A Christian Music Festival is scheduled for Saturday, August 28th at Peninsula Baptist. By God's grace, the festival will include several participatory singings, as well as live acoustic and acapella music from Christian groups. The Bisceglia family, The Allens, the Peninsula Baptist Children's Choir, and the Hardy Family are some of the groups scheduled to come. Save the date - more details to come! Our church is having a Summer Women's Bible Study on Fridays at 1pm at Margaret Hardy's house. If you are a lady in the Portland area and you would be interested in studying the Bible, feel free to email peninsulabaptist@gmail.com, and we can send you directions! We are currently studying "How Do I Live As a Christian?" The internet has many useful Christian resources! Let's glorify God in how we use the internet, "bringing into captivity every thought to the obedience of Christ." (II Corinthians 10:5). www.studylight.org and www.biblos.com both offer searchable bibles in many English translations and foreign languages, as well as helpful concordances and commentaries. www.twowaystolive.com is a basic presentation of the Christian gospel. www.albertmohler.com and www.epm.org both provide contemporary commentary, articles, and sermons written or linked to by Al Mohler (president of the Southern Baptist Theological Seminary) and Randy Alcorn (director of Eternal Perspective Ministries), respectively. www.spurgeon.org and www.johnbunyan.org include all the sermons and writings of Charles Spurgeon and John Bunyan, two famous historical Baptist preachers. www.boundless.org - Christian answers to practical life questions about relationships, career, etc. www.persecution.com is the Voice of the Martyrs website. It has a lot of prayer topics about our persecuted brothers and sisters around the world. www.imb.org and www.namb.net have info about international and North American Southern Baptist missions. www.jewsforjesus.org is the website of Jews for Jesus, an organization that spreads the gospel primarily to the Jewish people. Note that this is by no means an exhaustive list (and that Peninsula Baptist does not necessarily endorse every piece of content available through these websites…). This year (2010) May has five Sundays. 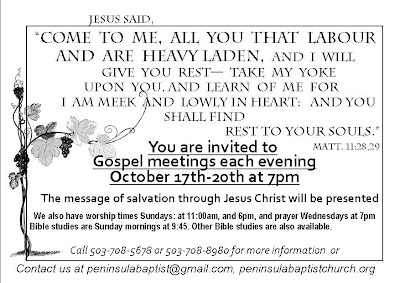 That means Peninsula Baptist will be hosting its regular fifth Sunday Sacred Harp singing. We begin singing at 3:00 PM and continue till 5:00 PM. As usual we will be singing from the Sacred Harp hymnal a 'shape note' hymnal which has been in continuous use since it was first published in 1844. Everyone is welcome. Looking forward to our upcoming revival! Everyone welcome - for more info, see the website. Join us for a reading of the entire Book of Acts! The reading is scheduled for Friday, February 5th at 6:30pm at the church. Everyone is welcome - we generally take turns reading, so feel free to come just to listen, or to read a selection aloud yourself. A Spring revival at Peninsula Baptist is scheduled for March 14-17! A student from Southwestern Theological Seminary will be coming to preach, Lord willing. 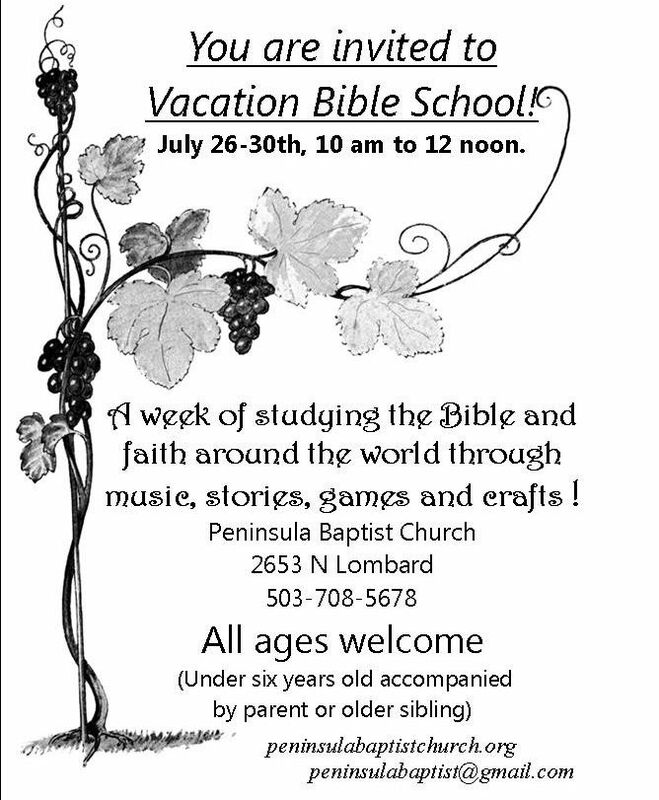 We're working on planning and praying to get ready - feel free to contact us at peninsulabaptist@gmail.com or 503-285-5701 for more information or to get involved. 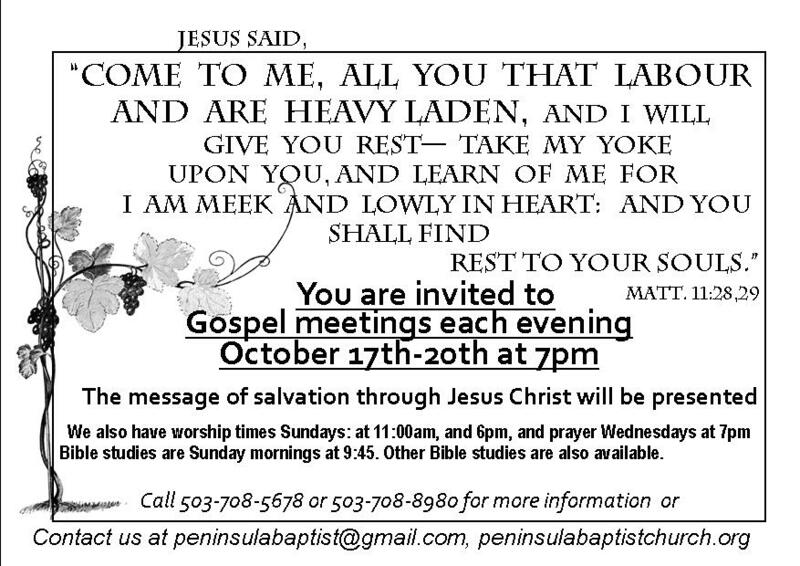 We wanted to announce a new weekly event at Peninsula Baptist Church - Sunday Morning Prayer. All are welcome to come and pray with us in the church library at 9am every Sunday! Bible studies follow at 9:45am. "Continue in prayer, and watch in the same with thanksgiving; Withal praying also for us, that God would open unto us a door of utterance, to speak the mystery of Christ..."